While the country has been fixated on President Trump’s firings, leaks, and outbursts involving the Department of Justice, that agency has itself been stealthily attacking our democracy by telling good lawyers to stop representing people. Four weeks ago, the Northwest Immigrant Rights Project (NWIRP)—a respected nonprofit in Seattle that represents immigrants in deportation proceedings—received a “cease and desist” letter from the DOJ threatening disciplinary action. The letter demanded that NWIRP drop representation of its clients and close down its asylum-advisory program. The reason: a technicality, perversely applied. NWIRP is accused of breaking a rule that was put in place to protect people from lawyers or “notarios” who take their money and then drop their case. Last week, NWIRP filed a lawsuit to defend itself against the DoJ’s order—and on Wednesday, a judge granted a restraining order. So for now, the organization can keep helping immigrants who need legal advice. But what’s at stake extends far beyond NWIRP and the 5,000 people it serves every year. The outcome of this legal battle will profoundly impact access to legal representation for the tens of thousands of immigrants who apply for asylum in the United States every year and the hundreds of thousands of undocumented immigrants whose cases are currently in front of an immigration judge. In the absence of a right to appointed counsel, a patchwork of underfunded nonprofits (like NWIRP) and attorneys do their best to help immigrants in court. These nonprofits leverage the volunteer work of lawyers at big law firms, who represent children and refugees in immigration and asylum proceedings for free. There are also a few thousand really good private immigration attorneys nationwide, which isn’t enough even for those who can afford to hire them. There are thousands more unqualified and dishonest scoundrels who steal money from immigrants too vulnerable to report them. And it is these thieves and cheats that the DoJ’s rules were meant to protect immigrants from. But in Jeff Sessions’s DoJ, the Disciplinary Review office of the Executive Office of Immigration Review is instead pursuing NWIRP, and will soon come after other non-profits. The accusation is that because NWIRP provides advice and assistance to people in immigration proceedings without committing to full representation, it is violating the rules. Precisely because this would be a cruel and absurd result, NWIRP and its peers around the country have had longstanding agreements with immigration officials that permit them to run asylum-assistance programs without committing to permanent representation. Attacking them now is a shockingly cynical move, akin to sanctioning an emergency-room doctor for sewing up a bleeding patient without first promising to be their doctor for life. NWIRP doesn’t know why it was singled out. But we do know that NWIRP has been at the forefront of resisting Trump’s travel ban. Its staff and volunteer lawyers were at SeaTac airport immediately after the White House launched the first Muslim ban, and in March it sued to block the second Muslim ban. 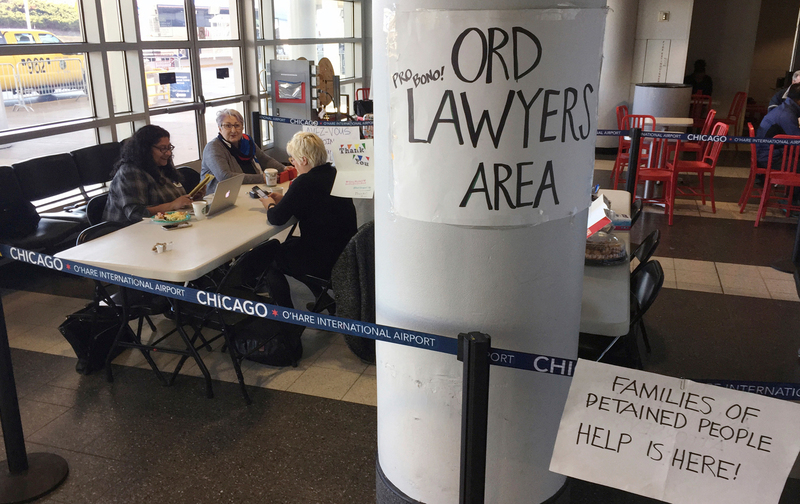 And NWIRP isn’t alone; its nonprofit counterparts did the same at airports around the country, leveraging law-school clinics and large-firm lawyers working pro bono. The DoJ’s suspiciously timed cease and desist letter sends a chilling message to exactly these groups, and to volunteer attorneys. This attack by the government on a legal services-provider for immigrants could dissuade law firms from letting their lawyers volunteer for these cases, scaring those firms away by convincing them that immigration-related projects are too risky pro-bono projects. If they succeed, they don’t just deprive people of scarce resources for volunteer counsel, they gradually muzzle the bar. They marginalize the heroic work of nonprofits like NWIRP and its peers around the country. They defang the big law firms that have been willing to stand up to this administration—like Davis Wright Tremaine, which is assisting NWIRP—and they make immigrant representation a more marginal part of the law. When lawyers rushed to airports this winter to protect our friends, our neighbors, and our Constitution, people cheered. The Trump administration took offense, and now those lawyers are in their crosshairs. The president is taking a sledgehammer to the pillars of our government: the FBI, the Justice Department, the federal courts. America, we are under attack. Editor’s Note: This story has been updated to reflect the fact that a restraining order enabling NWIRP to continue representing immigrants has been granted. Rachel B. TivenRachel B. Tiven is the CEO of Lambda Legal, the national legal advocate for LGBT and HIV+ people, and former executive director of Immigration Equality and Immigrant Justice Corps.